Governor Mitt Romney was building momentum going into Monday's third, and final debate, and remained unchanged in the debate aftermath. Debate polls will show it is about an even split, possibly even a few points in Barack Obama’s favor, but again, like the first and second debate, voters gave Romney overwhelming marks for their confidence that he could fix the economy. Although supposed to be exclusively focused on foreign policy, Governor Romneycleverly shifted the discussion over to his strong suit, by saying a strong American economy will make us powerful in the foreign policy arena. The Governor always had a pleasant smile on his face while he discussed the issues, in stark contrast to the glare and occasional scowl that presidentObama had on his face. 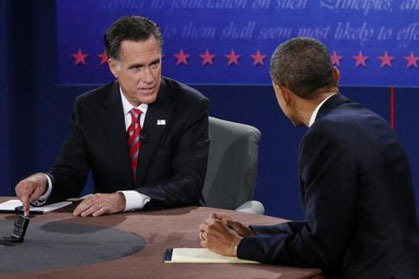 Compared to the first debate where President Obama barely looked at Mitt Romney, this time the President rarely took his eyes off of him. In someway this might have backfired on the President and made him appear too aggressive. ButGovernor Romney was not going to fall into any of President Obama's traps and get mired in small wonkish details, he stayed focused on the big picture, as Dr, Charles Krauthammer noted shortly after the debate. He went on to observe that “Romney won, both strategically and tactically.” Romneywent large while Obama went small, amazingly small, by attackingRomneyon in consequential charges that he invested in companies in China. It madePresident Obama look petty and un-presidential. But while Obama threw these petty charges his wayRomneynever got ruffled and kept an amused smile on his face. At one point in the debate Romney said that our navy was at its lowest ship strength since 1917, far below recommendations by the navy to carry out its worldwide missions. Obamaleaped at the opportunity to try to demeanRomney by saying “governor we now have ships that planes land on called aircraft carriers and we have boats that go underwater.” We can do more with far less. Of course the President overlooked the fact thatRomneywas quoting from present day naval experts on the need for a larger fleet than what we have presently. But it was an example of the pettiness and personal insults the President used throughout the debate. President Obama had no coherent comeback to defray the bad taste his apology tour left in many Americans mouths and what a slap in the face it was to our friends and allies, the Israeli’s.